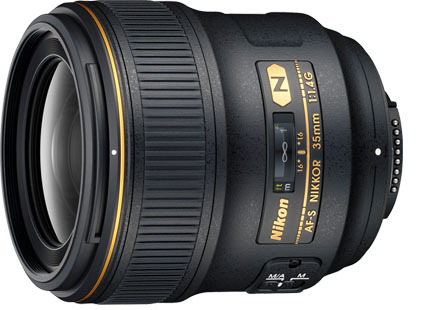 The Nikon 35mm f/1.4G AF-S Lens is a fast, classic semi-wide focal length that is wide enough to capture scenery but long enough to produce pleasing portraits without distortion. It can be paired with both full frame sensor cameras, such as the Nikon D810, and with crop frame sensor cameras, such as the Nikon D7200. The focal length equivalent on crop frame sensors is 52.5mm, which is perfect for portraiture. It sports an internal focusing mechanism that keeps the lens stable during use and won't change the direction of a polarizing filter or lens hood. This lens is a high quality prime that is fast enough for low-light shooting and quiet enough for ceremonies. • This lens is compatible with Nikon F mount cameras in both full frame and crop frame sensors. The focal length equivalent on crop frame sensors is 52.5mm.